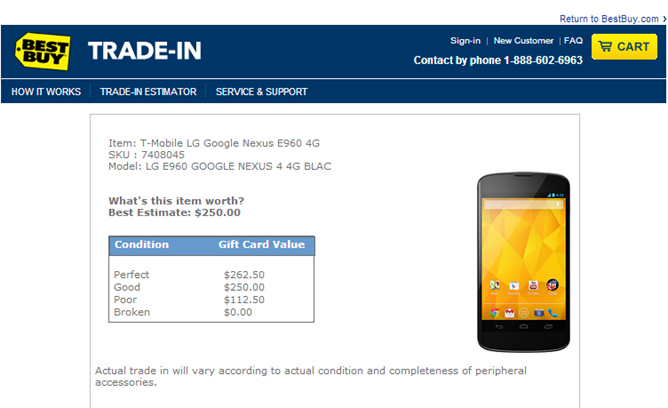 Get this - Best Buy is offering up to $262.50 for Nexus 4 trade-ins. This offer is valid regardless of whether you're handing over the 8GB or the 16GB model. As long as your device is in relatively good condition and you have the necessary peripherals, you're good to go. Just move quickly. 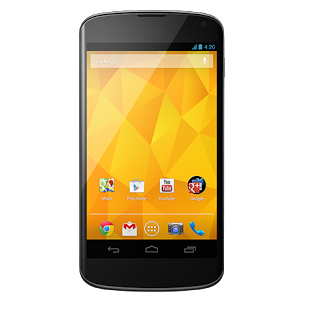 Considering the Nexus 4's $100 price drop last month, this probably won't go on for long. Unsurprisingly, how much you get depends on the condition of your device. Best Buy will only hand over $262 worth of gift card if the device is in perfect condition, but as long as it's at least in good shape, you could still net $250. This means that the device has only a few scratches on the case and none on the screen itself. If your Nexus 4 is any worse than this, it's only going to get you $112.50, assuming that it's still working. Note that turning on the device isn't enough to consider it usable. If it needs to be plugged in to work and the screen is considerably scratched, it's broken. Case closed. You can jump on this offer by heading over to the nearest Best Buy store or visiting the trade-in section of their website.